1891 Sep 16. . born Northwich, Cheshire. His father was a commercial traveller. I am not sure why he was in Indian Army. I suspect it is because he was the chap of this name went to Burma on business in Sep 1914, and presumably signed up there. He does not appear to have been seconded from a British regiment. I cannot find MC gazetted but he certainly had it. 1918 Feb 24, Staff Lt 2nd Class HQ unit. Maj. E. C. 0. Ross, Merwara Inf., Ind. 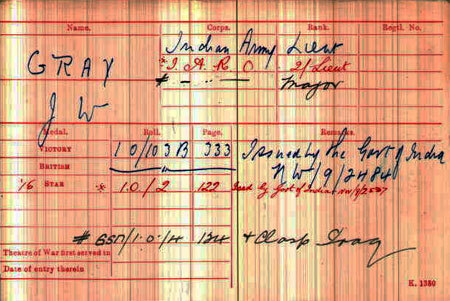 Army, vice Lt. J. W. Gray, M.C., Ind. Army Res. of Off. 1919 Feb 26. Indian Army Reserve of Officers. Lts to be Capts. J. W. Gray, M.C. 1919 Dec 7. Special Appointment attached to HQ Units. Comdts. (Cl. BB).—Capt. J. W. Gray, M.C., Ind. Army Res. of Off. , and to be temp. Maj. whilst so empld. 1921 Mar 11. Resignation accepted. 1921 Jun 15. Commts. (CL BB).—And relinquish the temp, rank of Maj . : — Capt. J. W. Gray, M.C., Ind. Army Res. of Off. 1921 Oct 24. The KING has approved the resignation of the following officers, with effect from the dates specified and the grant of the retention of rank as shown below: — INDIAN ARMY RESERVE OF OFFICERS. Captain, and is granted the rank of Major.